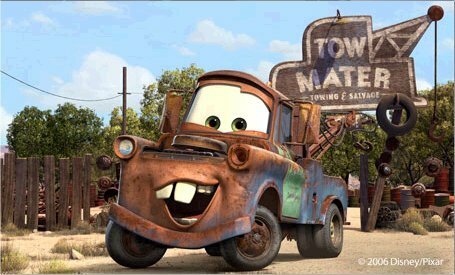 How old is Mater the tow truck. He seems like he's still a young truck. He acts like a kid at heart. But what's with his rusty color. He used to be baby blue but now he's rusty red? How old do wewe think he is? how do wewe know his birth date??? Wow, can wewe tell me in what tarehe is born Lightin McQueen ;D ? 40: cuz hes rusty. but since hes a kid in his heart,id say maybe 29-30-ish. Yeah,Id say in his middle to late 30. 2. He really acts like a kid and a teen. and 3. He does play with his buddy named Lightning Mcqueen. he's older than 20. Remember when he pulled his kofia out of a ditch (that's probably not the right word...) and exclaimed "It's my hood! it's my hood! i ain't seen this thing in 20 years!" Based on the flashbacks in the first movie he was young in the 1950s. I'd say he was in his early 60s.